Dubai, UAE, July 11, 2018: “Honor, courage, commitment”, as they say in the US Navy. Ulysse Nardin celebrated over a century of dedi-cation to nautical precision and values shared with the United States Navy by launching a special edition of its Executive Tourbillon: the “Stars and Stripes”. Created in homage to the American flag with its 13 white and red stripes and 50 white stars on a deep blue background, each piece in this limited line of 50 pieces, - one for each state in the Union – is as unique as its wearer. 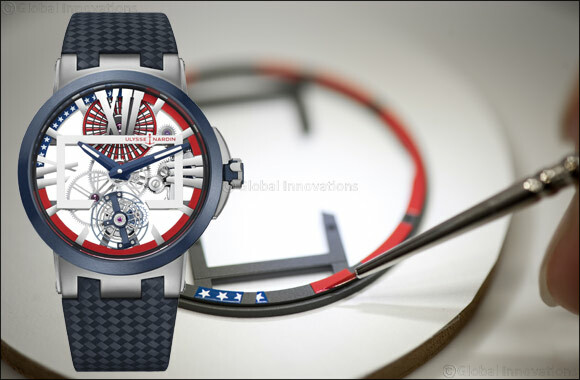 The Ulysse Nardin Executive Tourbillon “Stars and Stripes” was launched on the 4th of July in celebration of America's Independence Day. The US Navy, known for mottos such as “We shall not perish” equips its sailors with the most precise instru-ments known to man. In choosing its nautical supplier in 1902, it looked no further than Ulysse Nardin for its superb accuracy and traditional craftsmanship. Winner several times over of the Washington Naval Observa-tory's competition to equip its torpedo boats, Ulysse Nardin's instruments have been an essential part of US naval ships for more than a hundred years. With an ironclad reputation for excellence, Ulysse Nardin has allowed itself to take disruption to a new level with the Stars and Stripes. The arachnid-like skeleton movement reveals the delicate ballet of perfectly-meshed parts, each working in symbiosis with the others. Open-worked movements, the apex of high watch-making, are attempted only by expert horologers. A movement of this caliber has been stripped of all unnecessary elements, each piece angled and polished to perfection. Roman numerals add a touch of elegance and the titanium case ensures durability. The UN-171 manufactured model, with a tremendous and unequalled 170-hour power reserve (nearly seven days), is also an object of beauty topped with a blue ceramic bezel, blue crown and blue carbon effect leather strap. Painted using a micro-painting technique that at requires a paintbrush the width of a single eyelash, stars adorn the top and stripes decorate the cover of the cylinder. At its center is the distinguishing executive rectangle and each oeuvre is one of a kind.